Laura Balzer struggled to compose herself in the face of this new reality: I’m a liar. She winced at the word – a slap to her conscience. “Honey, we’re out of ketchup,” Muldoon yelled up from the kitchen. “Check the pantry, love.” She had to play it cool. “I’ll get it.” Laura scurried downstairs and emerged with his favorite condiment. “You’re the best!” Muldoon glowed at his good fortune. “Love you, too,” she chirped. Muldoon thumped the bottom of the ketchup jar, beaming at his precious wife. “I’ll be fine, I promise.” They hugged extra tight before she slipped out into the night, fastening her bonnet securely. But Laura never returned from the Salvation Meeting. 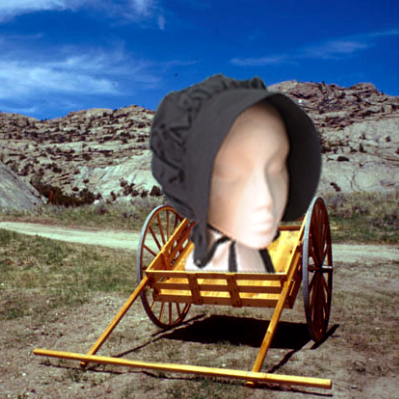 Muldoon later learned that upon her arrival there, Laura was set upon by a mob of angry men and women in black bonnets, that she was charged with deception and wheeled off to a prison in a handcart. And he knew. Either he had to believe her to be a liar or claim that she was framed. And if she was framed he’d have to act. Muldoon chose to stay home and eat ketchup sandwiches until the Salvation people in their black bonnets came for him.